A senior Fatah official and confidant of PA chairman Mahmoud Abbas says Mideast envoy Tony Blair is of "no use at all." A senior Fatah official and confidant of Palestinian Authority chairman Mahmoud Abbas called Wednesday for Tony Blair to be replaced as international Middle East envoy. Mohammed Shtayyeh, a Fatah Central Committee member, told Voice of Palestine radio that Blair was "no longer trusted to be an impartial mediator" and was of "no use at all." Shtayyeh said officials had also written to the Quartet whom Blair represents -- the European Union, United States, Russia and United Nations -- to say its latest proposition for a resumption of stalled peace negotiations was too vague to be meaningful. Israel has accepted the Quartet's grounds for negotiations without preconditions, but PLO officials say the Quartet failed to demand Israel stop building in the 'disputed territories,' which it says in sina qua non for talks to resume. The Quartet formula demanding that neither side undertake unilateral acts which could interfere with the talks was simply too vague, PLO officials said. "I believe the Quartet needs to work on itself more than anything else ... The situation does not permit ambiguity. Either settlement stops or there will be no negotiation," Shtayyeh said. "We do not expect much of the Quartet. 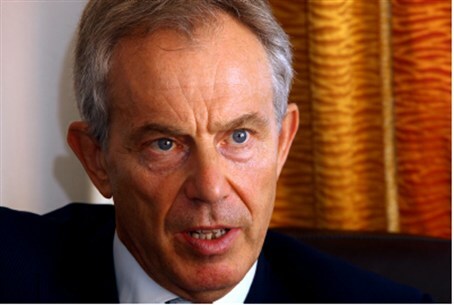 There is discontent with its envoy Mr. Tony Blair," he added. "Our general evaluation of his efforts is that he has become of no use at all. He has developed a large bias in favor of the Israeli side and he has lost a lot of his credibility." "We hope the Quartet will reconsider the appointment of this person," he added bluntly. Talks between Israel and PA have been stalled for almost two years despite a 10 month building freeze in the 'disputed territories' by Israel intended to bring PA officials back to the negotiating table, after which the PA launched its unilateral bid at the UN. Blair, who has been the Quartet's envoy since 2007, has focused most of his efforts on "easing the occupation in the West Bank" and is widely regarded by Israelis as sympathetic to the PA, which has led to surprise at calls from Ramallah for his ouster.